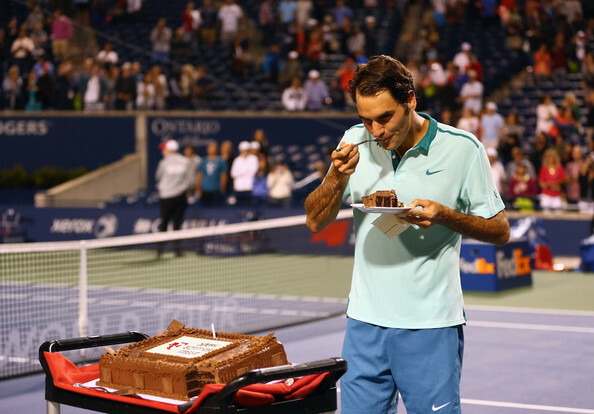 Roger Federer celebrated his 33rd birthday with a win over David Ferrer Friday night at the Rogers Cup in Toronto. The Swiss maestro needed three sets in order to advance to the semifinals, but for most of the match, was not in danger while going the distance. The two time Toronto champion took the opening set 6-3. The packed crowd at Rexall Centre sung happy birthday on the first changeover of the second set (video below), but later on, Ferrer would go on a streak, breaking the Swiss at 4 all and easily serving the match into the third set. Federer regrouped in the final set, securing the necessary break midway and hanging on for a 6-3 4-6 6-3 victory, staying unbeaten in his head-to-head record against Ferrer. In his 51st semifinal at the ATP World Tour Masters 1000 level, he will face Feliciano Lopez (8pm EDT/5pm PDT). Lopez defeated Raonic 6-4 6-7 (5) 6-3 earlier on Friday. Jo-Wilfried Tsonga takes on Grigor Dimitrov in the first semifinal (3pm EDT/12pm PDT). After the match, the 33-year-old Swiss reflected on his game toward the end of the match, as well as the tournament’s gestures over the years for his birthday. Rogers Cup sings Happy Birthday after first set.